‘Lice’ is most definitely a forbidden word in some homes. It all happens when you ever so sweetly kiss your kids on top of their beautiful little heads as you send them off to school. Yesterday you got a nice email from the teacher saying it was time to do a lice check in the classroom. So today, when that phone rings before lunch…you start to panic. Yep, it’s true. You’ve got to utter the awful phrase, “my kid has lice.” Yuck! Immediately, you begin to scratch your own hair and you haven’t even picked up your child from school yet! Everything you see has become a possible contamination source. If you weren’t a crazy clean freak before you had lice in your home, you most certainly are now! Fortunately, Eco Tech can help. Let us help to rid your Minnesota home with these nasty creepy crawlers and get you back to feeling safe! 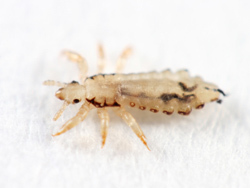 Lice are little tiny parasites that can be found on people’s heads and bodies. It is spread by person-to-person contact but can live on things like clothes, bedding, hats, carpets, etc., for days! So when someone brings it into your home, the chances of transmitting it to you and the rest of the family can be pretty high! The first step with any lice removal is to kill the lice and kill the eggs that are currently on your body. This will take a special shampoo that has both prescription and over the counter options. Using the shampoo and body washes are ultimately what is going to cleanse your own body, along with the comb that picks out the tiny eggs. Additionally, you will want to clean all clothes, bedding, hats, etc., that may have been affected. If something isn’t able to be washed in hot water, seal it up in a ziploc bag and keep it in the freezer for two weeks! The couches, carpets, pillows, toys, and curtains should all be cleaned thoroughly! Once all of this has been done, call Eco Tech to do a full extermination of your home! We treat both the inside and outside of your home, ensuring that those nasty parasites are definitely gone! We use a less toxic organic product line that keeps your family and pets safe while they are in the home. For more information on lice extermination in Minnesota, please call Eco Tech today! For an estimate, call us today at 763.785.1414.